Gate of New Beginnings by Thomas Kinkade is available for sale on paper or canvas, framed or unframed at special discount prices. Select from the following authentic Thomas Kinkade editions: standard numbered, artist proof, gallery proof, examination proof, international proof, publisher proof, renaissance edition, studio proof, Atelier National edition, and masters edition. "Perhaps in your own life you've had cause to reflect on a season of new beginnings recently. For many, the past few years have brought change. Gate of New Beginnings is an ode to the ever buoyant human spirit and to the constantly curving pathway of life." Exhibitor Proofs only comes in one size, and they are the first ones released to the galleries. Each canvas is individually hand-numbered and hand-highlighted and includes a Certificate of Authenticity. 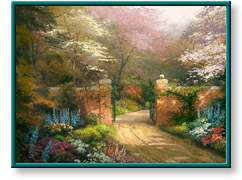 Gate of New Beginnings painting by artist Thomas Kinkade (also spelled Thomas Kincade, Thomas Kincaid, or Thomas Kinkaid) can be purchased in art print or canvas form at special sale prices at Christ-Centered Art.